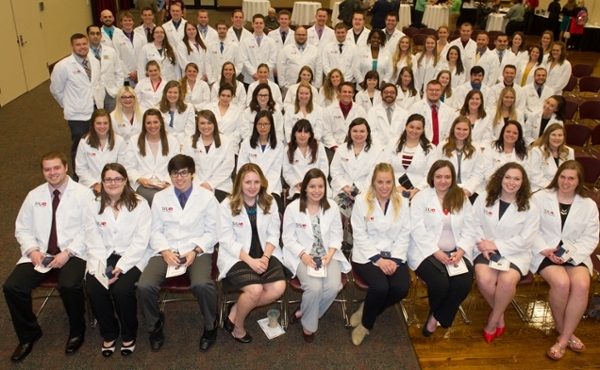 Southern Illinois University Edwardsville School of Pharmacy (SOP) year three students marked the next step toward becoming pharmacists at the School’s Pinning Ceremony, held Thursday, April 21 in SIUE’s Meridian Ballroom. Pins were presented to 73 students, with approximately 40 faculty, staff and other guests looking on. The receipt of their pin signifies the completion of the didactic portion of the curriculum and serves as a symbol of accomplishment as the students embark on their Advanced Pharmacy Practice Experiences (APPEs). Dean of the SOP Gireesh Gupchup urged the students to learn all they can during their APPEs. “When you graduate you will be teachers,” he said. “As medication experts, you will teach your patients and other health professionals. Photos: SIUE School of Pharmacy year three students at their Pinning Ceremony.